As a baby, removed from normal gorilla family life as a youngster – so profound were the misfortunes that Titus suffered in his early years that no gorilla scientist could have predicted his eventual rise to power. His moving life story is pieced together here for the first time, based on archive film and the memories of field workers who have studied the mountain gorillas since Dian Fossey’s pioneering work more than 40 years ago. At 33 years of age, Titus is not just one of the most powerful Silverbacks in Rwanda’s Virunga Mountains, he is possibly the most remarkable gorilla ever known. His life story is as full of drama, intrigue and tragedy as any human soap opera. Against a stunning backdrop of misty volcanic peaks cloaked in bamboo and giant lobelia, Titus has successfully steered his family group through thick and thin. Now he is under pressure again. Titus (24 August 1974 – 14 September 2009) was the name given by researchers to a silverback mountain gorilla of the Virunga Mountains, observed by researchers almost continuously over his entire life. He was the subject of a 2008 PBS Nature/BBC Natural World documentary film Titus: The Gorilla King. Titus was born on 24 August 1974. He was named by gorilla researcher Dian Fossey, who was observing his group at the time, after the eponymous protagonist of the Mervyn Peake novel Titus Groan. When Titus was four years old a blackback male joined his troop. He was named Beetsme by Fossey when she was asked by a visiting friend who he was and replied “Beats me”. 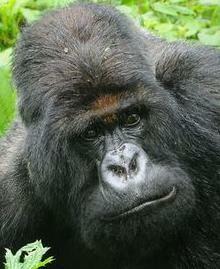 Shortly afterwards Titus’ father and dominant silverback Uncle Bert (named for Fossey’s uncle) was killed by poachers. Beetsme attempted to take control of the troop, killing the infant daughter of its dominant female Aunt Flossie. However the blackback was rejected and the females left. Titus and Beetsme, who seemed to have formed a bond, then became the nucleus of an unstable bachelor group. The troop was without females for eight years, during which time they were observed engaging in homosexual behaviour. When five females did eventually join the troop, Beetsme—now a fully-grown silverback—drove off the other males except Titus and became its dominant male. Titus, still a blackback, remained subordinate to Beetsme for six years. However during this time he mated covertly with the troop’s females. DNA analysis shows he sired his first offspring, Kuryama, by the group’s dominant female Papoose in 1985 – the youngest recorded siring by a gorilla. In 1991, now matured to a silverback, Titus began asserting his dominance over the other males in the troop and a year later, aged eighteen, he displaced Beetsme as the dominant male. Beetsme remained in the troop as Titus’ subordinate until his death in 2001. Titus sired more children than any other gorilla on record and by 2004 controlled the largest known gorilla troop in the world. By age thirty, however, his dominance was waning and he began regularly fighting with his silverback son Kuryama. He was also observed biting a female after she was caught mating with Kuryama in secret. This was noted by researchers as being at odds with Titus’ “calm” leadership style in previous years. In the spring of 2007 Titus led his troop to the peak of a volcanic mountain. The low temperature at that altitude threatened the younger members of the group and as Titus lingered there Kuryama made a bid for dominance. He successfully displaced Titus and then led the majority of the troop, including most of the sexually mature females and their offspring, away from the mountain. Titus did not resist but was not willing to give up his dominant position and so the troop was split. Some of the older females, including the dominant female Tuck, and their infants remained with Titus, as did a young silverback named Tuyizere. In May 2008 Titus and his following rejoined the main troop, which had grown by four new infants and two females. Titus accepted a subordinate position and supported his son Kuryama as the dominant male. Researchers reported that he was still regarded with great respect and affection by the rest of the troop. On 14 September 2009, at age 35, Titus died after a week’s illness.